I’m excited to welcome multi-award winning author Carla Killough McClafferty. Carla is the author of several book including, Forgiving God (Discovery House Publishers, 1995), an inspirational book for adults that deals with the Spiritual battle she faced after the death of her son. Many readers have found encouragement from her story when facing their own personal tragedy. Her children’s books include The Head Bone’s Connected to the Neck Bone:The Weird, Wacky and Wonderful X-ray (Farrar, Straus & Giroux, 2001) and Something Out of Nothing:Marie Curie and Radium (Farrar, Straus & Giroux, 2006). Carla’s books have received numerous awards and stellar reviews. 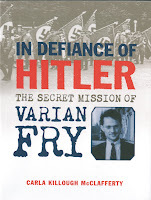 Her latest book, In Defiance of Hitler: The Secret Mission of Varian Fry will be released on September 2, 2008. The book is about an American Holocaust rescuer, Varian Fry, who was a Harvard educated American journalist who went to Marseilles, France in 1940 and arranged the escape of more than 2000 predominately Jewish refugees. Varian Fry was the first American to be honored at the Yad Vashem, the Holocaust Memorial in Jerusalem, Israel, as Righteous Among the Nations. This book has received a starred review in Booklist. Carla lives in North Little Rock with her husband Pat. Their son Ryan, lives in Benton and works as a salesman for Mutual of Omaha. Their daughter Brittney is pursuing a Master’s degree in Psychology from the University of Central Arkansas. Tell me a little bit about your book, In Defiance of Hitler: The Secret Mission of Varian Fry. It is a true story of an average American who became a Holocaust rescuer. After Paris fell to the Germans in 1940, countless refugees fled to the south of France and were trapped there. In New York City, Varian Fry and others created an organization called the Emergency Rescue Committee (ERC) whose sole purpose was to get many of Europe’s intellectuals to safety. Varian Fry, who was a Harvard educated journalist, volunteered to travel to France on behalf of the ERC to arrange the escape of as many people as possible. He planned to stay for two weeks, but ended up staying for 13 months—and only left then because France forced him to leave. More than 2000 predominantly Jewish refugees were rescued from the Nazis because of Fry’s work. The list of those he rescued includes Marc Chagall, Max Ernst, André Breton, Jacques Lipchitz, André Masson Franz Werfel, Lion Feuchtwanger, Victor Serge, Hannah Arendt, and Nobel Prize winning physicist Otto Meyerhof. What inspired you to write about Varian Fry? The fact that this average American volunteered to go to war-torn Europe to rescue people he did not know from the clutches of the Nazis. He had no background or training that prepared him for the job ahead—but he went anyway. It is an incredible adventure story of courage and determination. When I realized he was the ONLY American to be honored at the Yad Vashem as Righteous Among the Nations, I was amazed. Could it be that only one American had helped Jews during the Holocaust? I knew this was a story I must tell. By the way, since I began the book, two more Americans have been honored as Righteous Among the Nations—a married couple, Martha and Waitstill Sharp. How much research was involved in this project? I did a massive amount of research. I’ve read many books including those written by Varian Fry and by many of the refugees he rescued. I concentrated on primary sources. I traveled to Columbia University where the Varian Fry Papers are housed and did research. When I returned home, I arranged for interlibrary loans to look at each reel of microfilm that I didn’t get a chance to see while at Columbia—there were 14 more. I spent days and days plugging quarters into the microfilm copier. I read thousands of pages in those files to find exactly what I needed to tell this story. I also traveled to Los Angeles to meet with Pierre Sauvage, who runs the Varian Fry Institute, and looked at the many photographs in his collection. I also walked around the campus at Harvard when I traveled to Cambridge. In addition, I studied various sources to better understand what was happening in Europe in the years leading up to 1940—including reading Hitler’s infamous book, Mein Kampf. I’ve spent many, many hours looking at the United States Holocaust Memorial Museum web site, which is amazing in its scope of material. What was the most interesting thing you learned in the process of writing the book? The more I study history, the better I understand the saying “Freedom is Never Free.” To free others, it takes people who are willing to pay the price in their own personal lives. It costs something to be a hero. For Varian Fry, I think that in some ways he paid a high personal price to rescue 2000 strangers. Carla, thank you for sharing your fascinating journey.